I few weeks ago I submitted a photo to Neil Creek’s photography website for a View from below perspective. The submissions for this have now closed and voting is open. There will be one winner and I’m asking you to spend some time at the page to vote. I’m not telling you to vote for mine – but of course feel free to if you want. 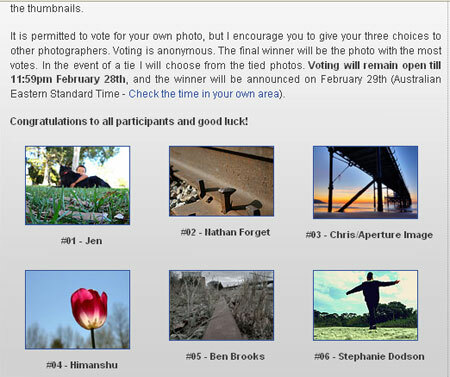 I don’t win a fantastic prize, just the satisfaction of knowing that my photo was ok.
Mine’s the first one on the page as shown below. Go here to vote or click on the image below to vote. You have until 28 February. I voted too – curious it’s only showing one vote…. Good luck, Jen. Just sent a vote your way too. I cast my vote Jen….Good Luck. Of course, I voted for you. Can you vote more than once over the next few days?